Fusion Rifles are special weapons (excluding Vex Mythoclast) and require a short charge time before releasing substantial damage at short-medium range, depending on the model you’re using. 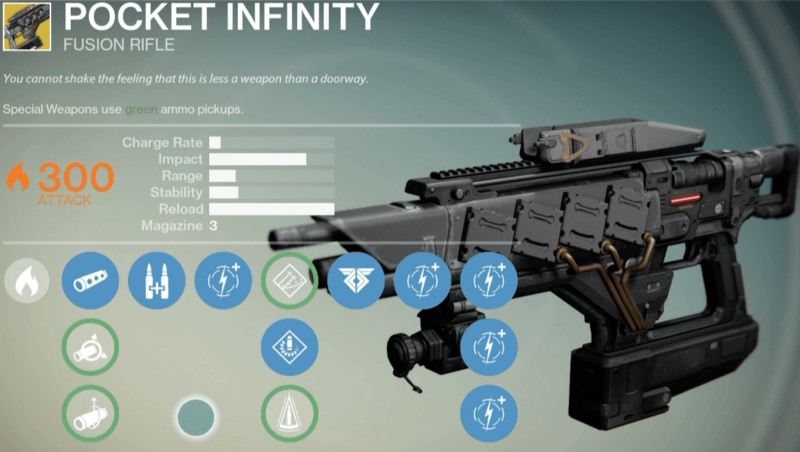 Fusion rifles do not suffer damage falloff, so sights are not as vital for improving long-range damage. 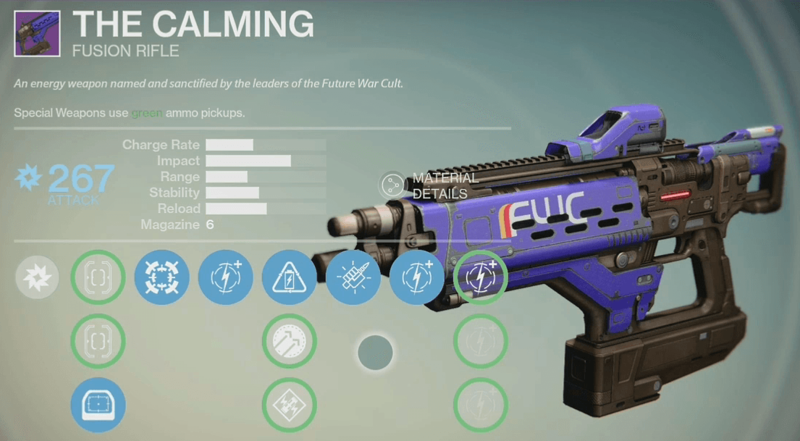 However, range affects fusion rifle projectile speed. The blasts travel more quickly when you have a mod like Hammer Forged, making it easier to hit a target at medium range with more of the shot. One critically important point: changing the Charge Time stat affects damage. If you have a slow charge time, you’re going to hit harder, but if you have a fast charge time, your shots are weaker. No weapon type is perfect, especially Fusion Rifles. The charge time varies between models and which means that any Guardian who gets too close will usually have the advantage. Because of these reasons, my personal opinion is that it is a fairly balanced weapon type. The variation in charge times also gives it a broad range of scenarios to fill while also giving a new learning experience to make the most out of the weapon; especially for Crucible will you want to know your charge time for peeking around a corner to get off a shot. So what Fusion should you be looking to get? The follow are the top 5 Fusion Rifles (excluding Vex Mythoclast) you might want to add to your bucket list. Weapon perks are randomized if obtained from a drop or reward making some versions more or less powerful! This may be a better one to start with since it boasts an extremely fast base-charge time (37). The range and Impact are below average though, so you either need to get a little friendlier with your enemies for a full charge on target or expect to take two shots. As an alternative to shotguns, this is a fantastic choice. This weapon excels in maps such as Firebase Delphi & Blind Watch. The fun was stripped away with the recent nerf to its magazine size (from 7 to 3). However, it’s still a powerful weapon – especially for downing Wizards lightning fast – being a Solar weapon. It’s got a slow charge, low range and high recoil, but it’s still one of the best because its full auto. After a lengthy charge release a triple charge in quick succession of each other will kill mostly anything in your immediate vicinity. We’ve got a full review for this weapon. For 150 Crucible Marks, or a lucky reward at the end of a game, this fusion packs a punch with near maximum Impact and great range. 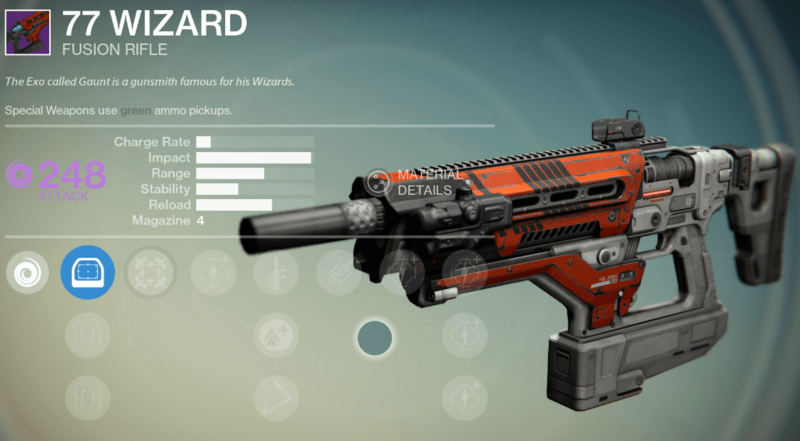 The standard vendor perks include Hip Fire, increasing accuracy when firing from the hip and Cascade which increases reload speed for a short time after melee kills. 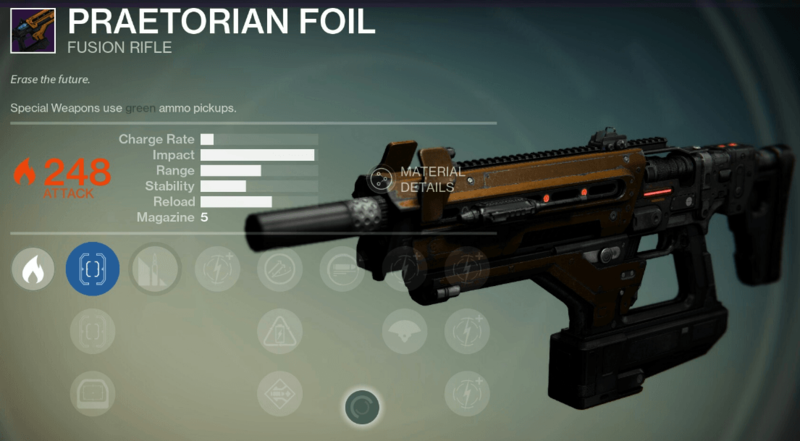 When upgraded this is also an excellent weapon for PvE . This is best used for maps with fewer close-quarter opportunities (Rusted Lands & Twilight Gap). Keep in mind that its slow charge might not suit everyone’s taste and a 4 ammo clip means you might also need a melee to grab the kill. Straight away you’re looking at an above-average balance of stats. Great Impact (87), range (50) and stability (46) with an almost-maxed reload (90. What makes this even better is the customization available through the scopes and upgrades so that it can be tailor made to your play-style. Its special feature includes not only a maxed weapon swap but also an almost-instant charge time after swapping, great for those tight spots in both PvE and Crucible. We’ve got a full review for this weapon too! Looking at the base stats, it’s not so different from the 77 Wizard: slow charge, high impact; but it does have slightly less range for improved handling. It’s one of the more difficult weapons to obtain, only dropping from Vault of Glass on Hard, but its perks dramatically increase the damage. Glass Half Full give the last two rounds a bonus damage modifier while Reactive Reload grants a damage bonus for a short time. As with all VoG weapons it also deals bonus damage to oracles making your raid night that little more relaxed. 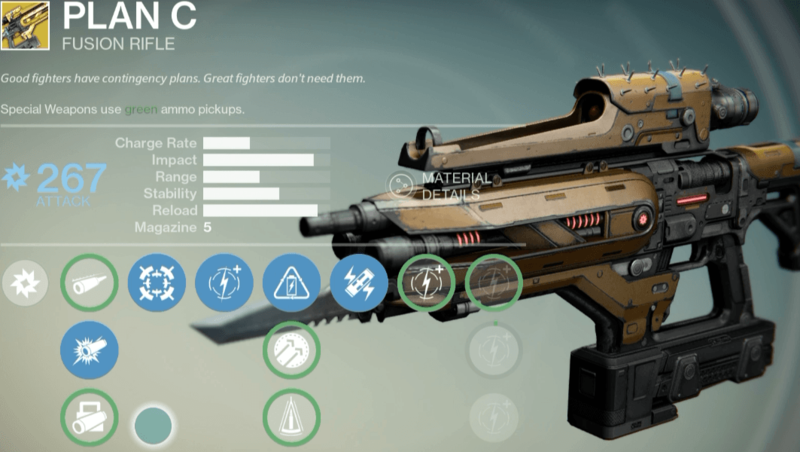 In the Crucible, with its array of useful perks, you’re going to be able to craft the weapon how you’d like. It’s got an insanely high Impact too, which will ensure quick demise of your opponents. What are your opinions on this weapon type? Is it your Marilyn Monroe or a Margaret Thatcher? And what Fusion Rifle do you prefer to use most?